Feeling I needed something a little more ‘hands on’ for my beat making and sampling needs, it was with a degree of caution that I added Native Instruments’ Maschine to my studio. If you’ve arrived here, you’ll most likely know what Maschine is, therefore I won’t bother explaining it in great detail, only to say that it is NI’s attempt at drawing the beat making crowd away from their MPCs and into a very clever marriage of dumb midi-driven hardware and powerful plugin-based software. It’s a complicated answer, unfortunately. 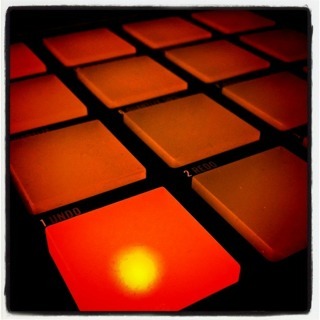 Certainly, from an MPC-syle beat creation perspective, Maschine is a joy to use. Sampling, too, is brilliantly implemented, making the process of building loops what it should be – fun and endlessly addictive. Time simply disappears while you’re using this thing. Hip Hop producers will love it and will be able to create sparkling productions completely within Maschine itself, with no need to switch to a DAW. Me? Not quite so simple, unfortunately. I have no interest in working with scenes and building up entire songs in that manner. The reason I bought Maschine was to gain an easy, more old school way of sampling and creating loops and drum tracks. The problem arises when you move over to your DAW of choice and mine happens to be Logic which, I’m sorry to say, is simply not a good partner for Maschine. Yes, you can drag and drop midi, but its a little cumbersome and, due to limitations with Logic’s use of AU plugins, Maschine itself is pretty much useless as a soft synth. That’s unless you’re willing to start adding the ancient art of program changes into your projects. I’m not. While considering the very real prospect of giving up and selling my shiny new bit of kit I came across a number of workflow suggestions and one in particular caught my eye. If you don’t mind (or even enjoy) working with Audio as opposed to midi, I highly recommend using that method of getting your Maschine-created beats into Logic. There’s one problem, though. Maschine will only allow you to drag entire groups into Logic which is fine and dandy unless you take some pride in the individual processing of your sounds. The solution is stupidly simple, but easily overlooked. Before dragging your audio across, solo one of your sounds in Maschine (for example, the kick). Then drag the audio into the DAW. The resulting audio file will contain just the soloed sound. Repeat the process for each sound and you’ll relatively quickly have individual audio files for each of your Maschine parts, all ready to be processed and arranged in Logic. A little bit long winded, but effective. Fancy a Game of 5-a-Side, Wayne?